Can't attend? Follow DevOps Indonesia to know of future events! Infrastructure as code is an essential practice in DevOps. By codifying our infrastructure, we enable better testing and quality control, more efficient and predictable deployments, and decreased recovery times. It provides improved testability and monitoring, lowers the cost of experimentation and innovation, makes deployments more predictable, and decreases the mean time to resolution for issues. 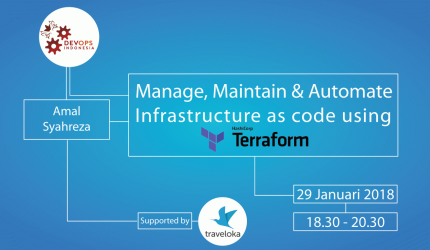 In this meetup, Amal Syahreza from Traveloka will share his knowledge and experience in managing, maintaning and automating the infrastructure as code using Terraform. Let's meet and discuss about the Infrastructure as Code and its technology. Book your calender, come and join the meetup! Snacks and drinks are provided.